“They” use these words to describe Babloo – the doctors, his family, his teachers everyone… except Vandana. She treats him the way he wants the world to see him. Mumbai… the city that defines his ultimate desires. Will it allow him the love and normalcy he so craves? Vandana… yearns for a soul mate to rescue her from the confines of the Railway Colony they all live in. Is she looking in the right place? Rail Man… a fearless, real-life hero who succeeds in doing all that Babloo secretly wishes to do… is Babloo his inspiration or… is it the other way around? When I Read this blurb on the back of the book and saw this image on the front I was sure I was going to read a romantic love story where the protagonist was mentally challenged. 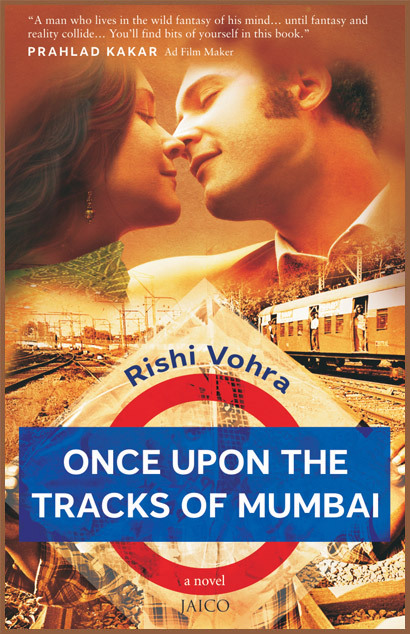 However, Rishi Vohra the author, had other plans and he packaged much more in to his debut novel “Once upon the tracks of Mumbai”. True to the title, “Once upon the tracks of Mumbai” starts, develops and concludes in a railway colony of the Mumbai city. The plot revolves around the railway employees, their kids and choices those kids make. The tracks are ubiquitous through out book for the fact that most of the times we are either transported to the those busy bustling Mumbai local stations or are invited to join the protagonist in his random soliloquies beside the tracks. Coming to the plot, the protagonist Babloo, suffers from mental disorders like autism and Schizophrenia. As a result he is slow at things and some how starts becoming a misfit for the fast paced, ruthless world we all live in. He takes six years to complete a three year degree, is unable to find a job, wanders aimlessly and has few friends whatsoever. This worries his family members and after a few attempts to change him, they become indifferent to this jobless, aimless elder son of theirs . In contrast, Raghu, their younger son is an achiever (or at least seems so) and brings home good marks, grades and even a decent salary. This, if anything, only enhances the pariah status Babloo enjoys in the home. Probably the only interesting part of Babloo’s life is Vandana, the neighborhood girl who behaves normally with him, who speaks to him, respects him and cares to spend some time with him. Naturally, Babloo gets attracted towards her, starts liking her and even loving her. Well what plans does Vandana have? What plans do her parents have? What is Raghu planning and more importantly what are his parents planning ? How does all this affect Babloo? How does he fall in the trap laid by the local play boy Sikander ? How does he break all the shackles of life, metamorphoses into the rail man and gun the glory he never even dreams of …. form the crux of the book. Coming to the style of writing, the books starts on a slow note. The first 50,60 pages of the book practically give a dragging feeling to the reader. As I was reading the book, I was getting a feeling like why is it so slow and dragging ? However the first part of the book actually lays a solid foundation for the second half where the story gathers pace and keeps the reader on his feet and glued to the book. So as you start the book, if it seems slow, stay put, yes stay put for some more as there are bigger and better things coming up. The second part of the book is too good and we start supporting Babloo in what ever he does. Secretly we start admiring him and start wishing him success. Almost like a bollywood plot the protagonist wins our hearts in his new avatar and everything starts falling in place. I loved the way the characters were developed by the author, in particular Vandana. The author did a brilliant job in portraying the middle class Indian girl. Her dreams, her aspirations, her longing for freedom, her frustration , then the way she accepts the reality and starts tuning herself and last but not the least the stroke of maturity she exhibits. “My goodness!! what a female lead for a debut book” was the first thought that crossed my mind as I finished the book. The characterization for the rest of the characters is also good, Vandana’s dad also deserves a special mention. The author does a great job in portraying a man of ethics who strives to be professional in every aspect of life. Coming to the areas where the book could have been improved, I felt the slack in the start could have been reduced if not avoided all together. Then, when it is Babloo it’s a first person narrative, when it comes to any other character it is a third person narrative. This sort of takes the reader by surprise and could have been avoided. Given the size of the book, the author could have dwelled more on the conclusion also, though a very nice conclusion I felt he could take have extended it a little more. That being said, it is a fantastic book. The vivid imagery and the author’s eye for detail practically transports us to the authors world. It does not bother whether he is describing a jam packed train, a dingy railway station, an unkempt bedroom, an untidy colony or a frightened individual. He describes so many aspects and attributes that we almost end up making a sketch of the person. Wonderful use of the imagery Rishi Vohra ji. As I told upfront, it not just a romantic novel. Rishi Vohra takes us through many things like societal attitudes, dreams, frustration, problems of youth, the crime on women, fight for justice etc … the list is long. The delicious mix of all this with love, hate ,lust and ambition makes the book worth reading. Do read the book, you would definitely like it. Don’t be surprised if it ends up being the plot of a bollywood flick in the days to come.